The Palestinian Center for Human Rights (PCHR) condemns the Israeli forces’ raid of “‘Ofer” Prison, west of Ramallah, and resulting in the injury of 100 Palestinian detainees and completely burning 3 cells. 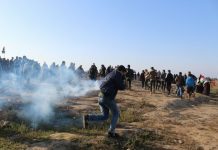 Yesterday, Monday, 21 January 2019, all the ten sections of the Prison, which include 1200 detainees, along with the minor detainees’ section, were all raided and the detainees were beaten up with batons amidst Israeli forces’ use of rubber bullets, teargas canisters and sound bombs. Most of the detainees were wounded with rubber bullets as they were taken to hospitals for treatment. Palestinian organizations relevant to the Palestinian detainees’ affairs emphasized that a special unit belonging to the Israeli Prison Service (IPS) surprisingly raided on Sunday, 20 January 2019, Sections (11 and 12) in Ofer Prison and searched the prisoners’ belongings, tensing the atmosphere among the prisoners. However, yesterday, 21 January 2019, there were consecutive raids targeting the rest of the sections in the Prison, including the minor prisoners’ section, as the IPS called for back up from 4 special units; “Massada, Dror, Yamam, and Yamaz.” The IPS’s units used rubber bullets, teargas canisters and sound bombs and severely beat up the detainees. This widespread attack is reminiscent of previous incursions carried out in varying periods by the IPS against Palestinian detainees in all 22 prisons established in Israel. One of those incursions was carried out on 01 February 2017, by the ” Massada ” unit in Nafha Prison in Negev, where they raided and searched Sections (2 and 12 ). They also suppressed detainees, brutally beat them, sprayed tear gas at them, and took some of them to other sections. Moreover, the IPS forces ordered the detainees to take off their clothes and forcibly took them out to the yards in the cold weather. These incidents come within the framework of a clear and systematic policy practiced by the IPS in order to impose restrictions and punitive measures on the Palestinian detainees and deprive them of their minimum rights. This constitutes a clear violation of all international laws and standards and exposes the Israeli arbitrary practices against the Palestinian detainees inside the Israeli jails, which are considered as war crimes. PCHR is concerned over the deterioration of the detainees’ conditions in the Israeli jails, pointing out that around 7,000 detainees are living in deteriorating conditions. PCHR calls upon the international community to put pressure on Israel and compel it to abide by the international principles and rules that protect detainees and preserve their rights and dignity.